It’s that time of year again, friends – Wahoo! Strawberry season! To be fair, strawberry season is still a few weeks away in my Northern climate. However, my sister is visiting from Arkansas, and brought several boxes of fresh picked berries with her (isn’t she awesome?). The thing about strawberries is, they’re delicious for about one day after they are picked. If you have a large quantity of strawberries to preserve, you need to work fast! Yummy Strawberry Freezer Jam is super fast! Ready… Set… GO! Step 1) Place halved strawberries in a large pot. Mash the strawberries a few times with a potato masher. Add sugar, cinnamon, and lemon juice. Step 2) Bring strawberry mixture to a full, vigorous boil over medium-high heat, stirring frequently. You want this mixture to really boil… it should boil enough that bubbles continue to cover the surface of the mixture even when you are stirring! Step 3) When your strawberry mixture has reached a FULL boil (this will take at least ten minutes, maybe longer), stir in the pouch of pectin. Allow the mixture to return to a FULL boil, and boil with stirring for two minutes. This entry was posted in Canning and Preserving, Fruits and Veggies, Gluten Free, Vegan and tagged canning, Cooking, farming, Food, frugal, Gardening, Gluten Free, Green, Homesteading, jam, Jelly, Preserving, Recipes, Vegan. Bookmark the permalink. 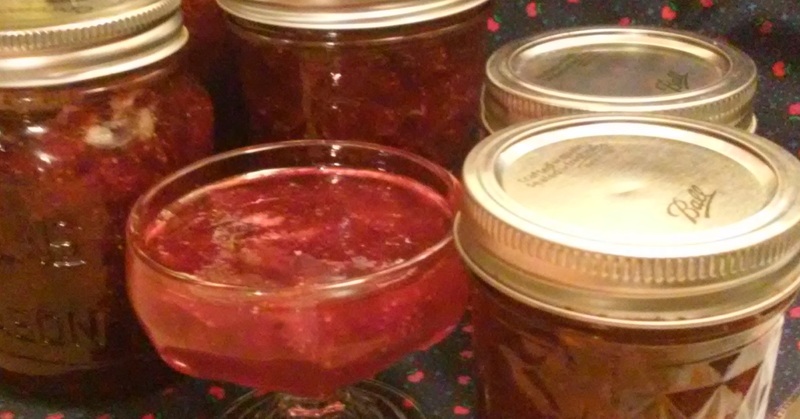 I was lucky enough to be gifted some of this awesome strawberry jam. We actually drizzled some over cheesecake slices last night. Took dessert to a whole new level! Also great over waffles. Also great just eaten off a spoon. Just saying. I like it as a spread between slices of sweet bread (banana bread, that sort of thing) – it keeps the bread from drying out.